Chanukah celebrations are joyous occasions with lots of holiday gifts, decorations and parties. The eight-day festival of Chanukah retells a story about hope, the importance of maintaining Jewish traditions, and the symbolic power of light. 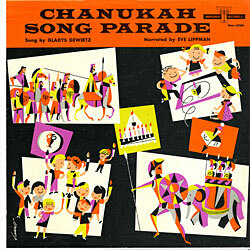 Of course, at the Judaica Sound Archives we always celebrate Chanukah with music! 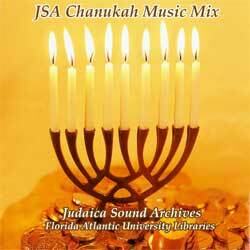 Back by popular demand, the JSA’s wonderful collection of Chanukah songs that will entertain and delight the entire family. From the Children’s Village Choir singing Hanukkah is Here to Moshe Oysher singing Maoz Tzur with his sister Fraydele and his niece Marilyn Michaels, the songs in this collection express the essence of the holiday. Joyous songs, children’s songs that teach about the holiday, traditional songs, and a new twist on an old favorite have been included. May your holidays be filled with the music that fills your heart. Best wishes for a Happy Chanukah!